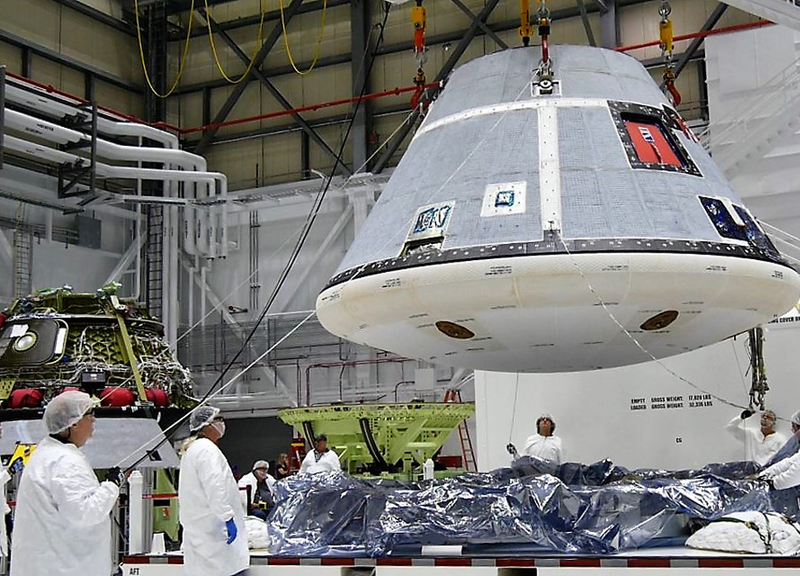 Boeing, NASA and U.S. Army teams rehearse safely bringing the CST-100 Starliner spacecraft home to Earth on Wed., June 6, 2018, at the U.S. Army's White Sands Missile Range in New Mexico. NASA CCP astronauts Bob Behnken, Eric Boe and Doug Hurley conduct a full-suited exercise in Boeing's CST-100 Starliner mockup trainer at the Johnson Space Center in Houston in early May. United Launch Alliance (ULA) and The Boeing Company today unveiled an updated aerodynamic configuration of the Atlas V that will launch Boeing's CST-100 Starliner capsule for NASA after encountering unique challenges with aerodynamic stability and loads. Engineers from NASA's Langley Research Center in Hampton, Virginia, and Boeing dropped a full-scale test article of the company's CST-100 Starliner into Langley's 20-foot-deep Hydro Impact Basin. Two of the four NASA astronauts training to fly Boeing's CST-100 Starliner spacecraft recently tried some of the systems that will prepare them for flights to the International Space Station. The Boeing Company (BA) [NYSE: BA] reported second-quarter core earnings per share (non-GAAP) of $2.42, reflecting strong performance and favorable tax items. Second-quarter 2014 results included a $272 million after-tax charge ($0.37 per share) on the KC-46A Tanker program reflecting the cost of additional engineering and systems installation work required to complete the Engineering and Manufacturing Development contract. Boeing (NYSE: BA) has named Craig R. Cooning president of its Network & Space Systems (N&SS) businesses, effective immediately. Cooning succeeds Roger Krone, who took a position at another company. The Mexican Ministry of Communications and Transportation (SCT) and Boeing [NYSE: BA] are a step closer to enhancing Mexico's mobile communications capabilities for government applications with the completion of the second Mexsat 702HP (high power) geomobile satellite. Boeing [NYSE: BA] will webcast its annual investor conference on May 21, beginning at approximately 10:30 a.m. Eastern Time. Boeing will expand its presence in Florida by adding technology, engineering and support jobs at the Kennedy Space Center. Financial and employment details are not being disclosed. The first of three Inmarsat-5 Global Xpress (GX) satellites being built by Boeing [NYSE: BA] has successfully completed a key system life test, paving the way for it to launch later this year. The satellite performed as expected during the spacecraft thermal vacuum test, which simulated the cold, airless vacuum of space. Boeing workers lift the Global Positioning System (GPS) IIF-5 satellite onto a transporter following its Aug. 1 arrival at the Navstar Processing Facility on Cape Canaveral Air Force Station, Fla. The Boeing Company of Houston, a NASA Commercial Crew Program (CCP) partner, recently performed wind tunnel testing of its CST-100 spacecraft and integrated launch vehicle, the United Launch Alliance (ULA) Atlas V rocket. A Boeing X-51A WaveRider unmanned hypersonic vehicle achieved the longest air-breathing, scramjet-powered hypersonic flight in history May 1, flying for three and a half minutes on scramjet power at a top speed of Mach 5.1. The vehicle flew for a total time of more than six minutes. Boeing is developing a family of small satellite prototypes, called Phantom Phoenix, that can quickly and affordably be manufactured and configured for specific missions. The Boeing Company of Houston, a NASA Commercial Crew Program (CCP) partner, has successfully completed a preliminary design review (PDR) of the component that would connect the company's new crew capsule to its rocket. Reuters is reporting that Boeing filed a lawsuit last Friday to recover $350 million from RSC Energia and its partners in Sea Launch for refusing to pay their share of loan guarantees after the joint-venture went bankrupt in 2009. Boeing and NASA recently established the firm baseline configuration for the company's Commercial Crew Transportation System, achieving the first performance milestone in NASA's Commercial Crew integrated Capability (CCiCap) initiative. The Boeing Company has delivered NASA three flight computer software test beds, the first critical element for flight software development in support of NASA's Space Launch System (SLS). Flight software controls the launch vehicle during preflight tanking operations and in flight. The Boeing Company has successfully completed a new milestone in the development of software that will operate its Crew Space Transportation (CST) spacecraft. The company is one of NASA's partners developing commercial crew transportation capabilities to ferry U.S. astronauts to and from low Earth orbit and the International Space Station. Boeing successfully completed the second parachute drop test of the company's Crew Space Transportation (CST)-100 spacecraft on May 2 at the Delamar Dry Lake Bed near Alamo, Nev. The test demonstrated the performance of the entire landing system. Boeing has signed an agreement with NASA's Mission Operations Directorate (MOD) at Johnson Space Center to collaborate on mission planning, training and flight operations for the company's Commercial Space Transportation (CST)-100 spacecraft. Boeing announced today that the U.S. Air Force accepted control of the fourth Wideband Global SATCOM (WGS) military communications satellite on April 11, after the spacecraft passed several weeks of rigorous on-orbit tests. Boeing successfully completed a parachute drop test of the company's Crew Space Transportation (CST)-100 spacecraft today at the Delmar Dry Lake Bed near Alamo, Nev. CST-100 is part of the Boeing Commercial Crew Transportation System (CCTS), which will provide the United States with the capability to transport people and cargo to the International Space Station (ISS), the Bigelow Aerospace Complex and other destinations in low Earth orbit.